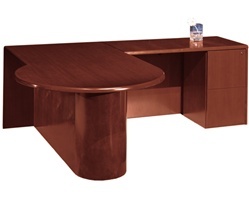 Ofconcepts offers many High-Quality, Value-Priced wood veneer desk series from name brand manufacturers such as Global-Offices To Go, Mayline and Cherryman. They are Stocked for Quick Delivery Nationwide. The Ventnor Veneer Series from Offices to Go by Global emphasizes sophisticated styling and value pricing. Stocked in both Cordovan and Toffee finishes, this series is ideal for Executive Offices, Conference Rooms and Reception Areas. This series is standard with stain nickel handles, solid wood fluted edges and top quality full extension ball bearing drawer slides. The Jade Wood Veneer Series is a full-featured offering stocked in both Chestnut Cherry and Henna Mahogany finishes. Metallic silver handles come standard on this series and it is in stock for quick delivery. The Ruby Wood Veneer Series by Cherryman is a value-priced wood veneer series available in a Paprika Cherry finish. With configurations and storage options are available, this series is in stock for quick delivery. A distinguishable...adaptable...and affordable office furniture line! The Stella Series, from top business office furniture maker Mayline, breaks down the price barrier for wood veneer case goods while providing great style and functionality for any office. 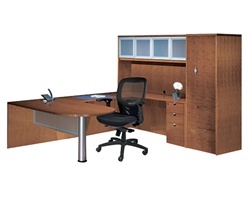 The distinctive design elements that are found throughout the Stella line of office furniture for sale at Ofconcepts.com. With floating unique mobile storage configurations that includes sliding-door hutch, and companion components set Stella far apart from its peers. In addition, all Stella surfaces are protected with UV-cured process that diminishes fading gives the Toffee finish a long lasting durability. The Ventnor Series Wood Veneer desk solution for business office furniture emphasizes sophisticated styling with the beauty of genuine wood veneer that increases the profile of the office. In tandem with not only business office chairs but also with executive leather office chairs the Ventnor series of wood veneer desk can ad prestige and a high style look without the price. The solid wood fluted edges finished in either a rich satin gloss Toffee or Cordovan finish will extenuate the wood finish and grain look that is the highlight of the Ventnor series of office desk. The Margate Series of affordable office furniture emphasizes not only clean, contemporary styling but also the beauty of genuine wood veneer at the price of office furniture outlet. The solid wood edges of the Margate series office desk are finished in a rich satin gloss Cordovan finish that radiates the classic look but maintains the contemporary office desk feel. 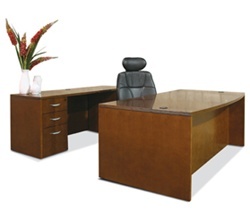 The Margate series of business office furniture is the epitome of stark, clean and strong features and lines. The Luminary series from Ofconcepts is designed with today’s sensible buyer in mind for the versatile and efficient office space. The quality and adaptability of the Luminary line of veneer office furniture computer desk at an amazing price. Available in two finishes with AA-grade durable and resilient North American hardwood veneers that give the natural and airy look to any office. The Luminary office desks have beautiful veneers that match and highlight the natural beauty of the wood grain and will fit seamlessly with modern office chairs for a fusion of classic and modern. The Mira’s simple and smooth curves create an elegant tone and setting for any work environment that needs deep, dark and rich affordable office furniture. The finest quality workmanship, in-stock availability and affordability make it a very popular series that not only goes ties in well with other leather office furniture and office furniture workstations that is needed for the modern office setting. The Mira series of business office furniture is available in medium cherry finish on cherry veneer that is able to set the warm and subtle tones for the interactive office environment. The Napoli veneer desk system features Mediterranean and Italian-influenced styling that offers sophisticated styling for business or home office. The Napoli series available in three rich finishes, with AA-grade durable t North American hardwood veneers throughout the whole desk. Silver on the Napoli series of business office furniture adds a detailed and contemporary look not normally found in office furniture workstations that are made to go with companion modern office chairs. The Napoli series is not only influenced by the charms and style of Italy but also has the modern and contemporary edge that integrates well modern office productivity devices. The Corsica veneer desk system offers not only a sophisticated update look while keeping an elegant appearance beautifully suited for business or home office is the understated feel of the Corsica series. The Corsica series is available in two rich finishes that expands the range and ability of compatibility with not only office desk chairs but also home office chairs. This series features AA-grade durable select North American veneers throughout the whole body of the desk. All the veneer surfaces of the Corsica series are protected with two final coats of high-tech catalyzed lacquer that ensures not only a polished look but also durability and longevity also. The Sorrento series veneer desk system is a transitional line of wood office furniture for top executive offices, centrally located individual workspaces, high traffic conference rooms and high exposure reception areas. The Sorrento series combines a high-end look and technology- friendly features that give wood office chair and desk combinations that will give your office that timeless upgraded look. With the use of AA-grade durable North American hardwood veneer finish the Sorrento series is sure to fit into any elegant and trendy office setting. The Eclipse series desk system features Italian oriented is specially designed with floating work surfaces that gives and efficient work area that is also stark and clean but remains fresh. The Eclipse series desk has a bevel hardwood edge that increases the available work surface but also allows those on opposite side of the desk to be closer and maintain an intimate distance. This series of desk is available in two finishes, which is coated in a AA-grade durable North American hardwood veneers used throughout the whole desk. The Emerald Veneer Series by Cherryman one of the top manufacture of office business furniture that has excellent wood veneers that are the best premium grade quality construction. The Emerald series of wood veneer desk are flat cut and matched to insure color continuity and a composed and total look of business office furniture made to impress. Available in two strong finishes that goes well in tandem with multiple office chairs on sale on Ofconcepts.com. The Emerald series provides superior strength and resilience with enhanced stain and scuff resistance for easy maintenance. The Emerald series is the hallmark of strong styling with adaptable features. 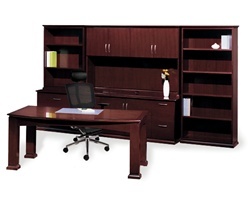 With this series available in either chestnut cherry or henna mahogany veneer finish, the Jade series of business office furniture provides superior strength and enhanced stain and scuff resistance for easy maintenance and clean up. With the choice of finishes and this contemporary office desk provides not only the function but also the look needed for cutting edge businesses. The Jade series of veneer finished office desk utilizing not only a satin sheen and closed pore standard wood veneer finish that will withstand whatever will be thrown at it in the workplace. The Ruby series of business office furniture is available in a paprika cherry wood veneer finish that is not only beautiful and compliments many ranges of modern office chairs but also get along well with leather office furniture that will be place alongside of the Ruby series of business office furniture. The Cherryman veneers are premium grade quality finishes which are designed in tandem with the flat cut surface and have a slip resistant surface. Every possible effort is made to ensure color continuity and tasteful glossy finish that has become the hallmark of smart contemporary styling. The Topaz series of affordable office furniture is available in a chocolate mahogany wood veneer finish that radiates a dark rich look that will make any complimenting piece of office furniture from modern office chairs to executive desk chairs. The detailed, rich traditional styling of Topaz allows a dark and strong feel while setting a warm tone for your office. The Topaz series is a complete desk system with desks, credenzas, bookcases, conference table, occasional tables which allows you to coordinate in style without the hassle and cost associated with finding and buying coordinated and seamless furniture pieces. The impressive atmosphere set by the Easton series of business furniture is well suited for executive suites and boardrooms and brings a distinct style to suit your individual discerning taste. The Easton series of business furniture is the type of office furniture workstations needed for the busy and efficient executive. The powerful atmosphere and look of the Easton series will bring swivel desk chairs, ergonomic seating and other leather office furniture into the fold that will project the look and feel of a strong and successful executive.